For an easy way to keep track of all TASIS events and consolidate your calendars into one system, you can import the TASIS calendar into another calendar system (such as Google or Apple calendars) using an iCal URL. 1. Visit www.tasis.ch/calendar to view the All-School Calendar page. 2. Click the 'export' icon in the top menu of the calendar page to open the Calendar Export menu. Click "iCal Feed." 3. On the pop-up menu, click the iCal button for the calendar(s) you would like to feed. 4. 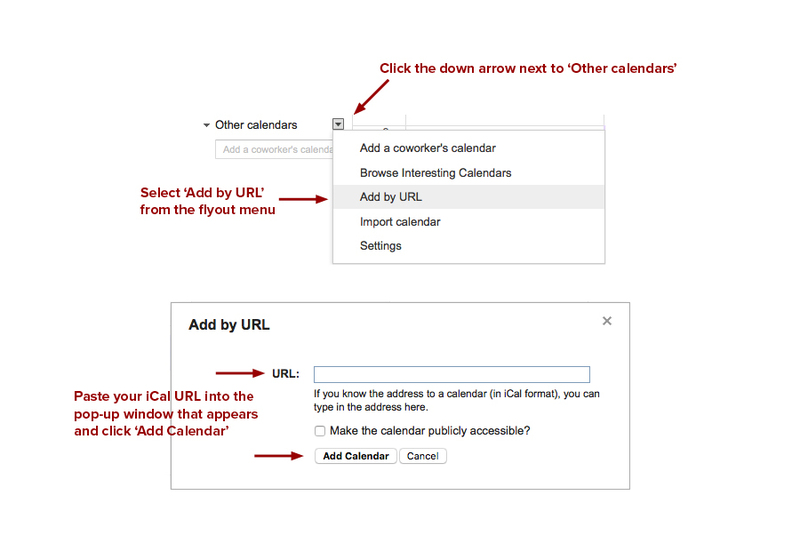 Choose the iCal URL for your calendar system. Please note that Google calendars require the specific Google iCal URL. 5. Copy the iCal URL from the box that appears. Open your calendar system, follow the import procedure, and paste this URL into the appropriate field. Visit google.com/calendar and make sure you are logged into your account. Make sure you have the specific Google iCal URl type copied from your source calendar (ending with _gmt.ics).